The Criminal Court last night released a suspect arrested by police in connection with the attack on Minivan News on Thursday afternoon (September 25). Police arrested the 32-year-old man Thursday night on charges of stealing a CCTV camera outside the Minivan News building and took the suspect before a judge last night seeking extension of detention. A machete knife was buried in the door of the Minivan News building after a man in a white shirt – clearly identifiable on the CCTV footage – removed the security camera. Police have confirmed to local media that the suspect was released with conditions. According to the Criminal Court, the three conditions were cooperating with the police investigation, not leaving Malé without informing police, and not causing any disturbance. Local media has identified the suspect as Ahmed Muaz, known as ‘Gatu Mua,’ an alleged gang leader with a criminal record for theft and other offences. Shortly before newspaper Haveeru published the news of Muaz’s arrest on Thursday night, a journalist at the local daily received a death threat via text message from a private number. “If you write the name [of the arrested suspect] we will wipe you out. Remember that,” read the message, which was also posted on Twitter by the journalist. Other media outlets reportedly received threatening phone calls warning them not to name the individual. According to Haveeru, Muaz refused to get into the police van when police attempted to take him into custody. “He went to the police office on his own cycle,” the newspaper reported. Following a meeting between journalists and Naseer late on Thursday night, the minister released a press statement the next day assuring that the attack on Minivan News as well as threats to journalists would be investigated with seriousness and urgency. As the incident was related to “gang activity,” Naseer said the government was taking prompt action. “[We] offer assurance that the government’s efforts to find an adequate and permanent solution to the environment of crime created in the Maldives will be carried forward without interruption,” the statement read. The Minivan News office building was also evacuated on Thursday night following threats of an arson attack. A similar threat was sent to opposition-aligned private broadcaster Raajje TV. The attack on the Minivan office came after an investigation report – commissioned by the Maldivian Democracy Network (MDN) and conducted by Glasgow-based Athena Intelligence and Security – into the disappearance of Minivan News journalist Ahmed Rilwan was made public. The abductions in June followed local media reports of a meeting between Islamic Minister Dr Mohamed Shaheem Ali Saeed and youth groups who expressed concern over insults to Islam online and the promotion of homosexuality. Witnesses to the abductions told Minivan News that the individuals photographed in the meeting formed part of the vigilante group that carried out the abductions in June. The investigation report commissioned by MDN claimed that Muaz met both Islamic Minister Shaheem and Home Minister Umar Naseer. In an apparent reference to the meeting with Muaz, Home Minister Naseer tweeted yesterday (September 26) that his “daily schedule involves meeting people who request for appointments”. “Muaz’s concerns included the growth of secularism, which he believed would eventually destabilise the Maldives as rifts between Islamists and secularists erupt into open violence,” the investigation report stated. 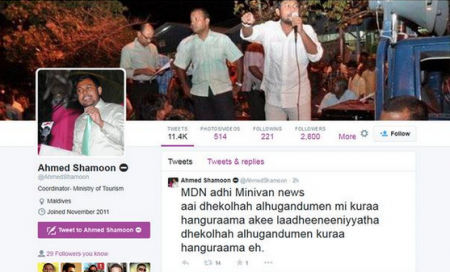 Meanwhile, Tourism Ministry’s Coordinator Ahmed Shamoon tweeted yesterday of a war against MDN and Minivan News. The ruling Progressive Party of Maldives member later deleted the tweet and claimed the screenshot circulating on social media was “fake”. “The war we are waging against MDN and Minivan News is a war against laadheeniyath [secularism or irreligiousness],” read the tweet. And that's why the criminals went on a rampage when their judge was arrested. Because without him, they'd be forced to face the consequences of their actions. The only people this tough gangsta hackles are innocent individuals walking on the streets. Nah, it's not him. There were no four independent witnesses. Video cannot be evidence. It wasnt there in the 6th century. Poor poodles cannot accept anything that wasn't there then. If video is considered at any stage here, the whole religion would be exposed for it is. Well said. Biggest gang is called mamnoon. Kudos to Minivam news for not giving into the intimidation and publishing his full name. Dhi TV never showed his picture or named him, buggers tried their best to hid him. and its only Minivan news which published the details of this man. and no surprised there. people like these are the pawns. and it would be almost impossible to trace back to the source which gives out the orders. Maldives: Paradise for non Maldivians and criminals. sad to make that statement. but given the situation. there is no other way to define it. No need to harp we have extremist and gangsters in Maldives.